Does Jellyfish Protein Work for Memory Loss? Those with brain fog from chemo or memory loss from aging, Alzheimer’s or dementia of any kind are often looking for answers. Since research about jellyfish protein is preliminary, there seems to be a need not to be too dismissive, to avoid dashing hopes for no reason, but there’s also plenty of room for healthy scientific skepticism. Could a Protein Supplement Possibly Work? The answer here appears to be a resounding yes, followed by a gigantic HOWEVER. Yes, scientists know that dietary proteins can have biologic activity—dietary proteins function not just as sources of amino acids but also as otherwise active players: Within the GI tract, proteins and their breakdown products, peptides, can interact with receptors releasing hormones, affecting things like stomach emptying and absorption, transmitting neural impulses to the brain and modifying the bacteria that live in the gut, the microflora. So, could a jellyfish protein theoretically have a positive impact somewhere far from the gastrointestinal tract? Yes, it’s possible. But not in the way you might think. Dietary proteins are not known to translocate from the gastrointestinal tract to neurons in the brain. For believers, it may be comforting to know the supplement is made in the United States, which has more consumer-protective regulations than supplements made, say, in China. But when talking about benefits, there are always problems and challenges associated with going from theoretically possible to clinically proven. The jellyfish protein in question is an apoaequorin, a calcium-binding protein first discovered in the jellyfish Aequorea Victoria in 1962. 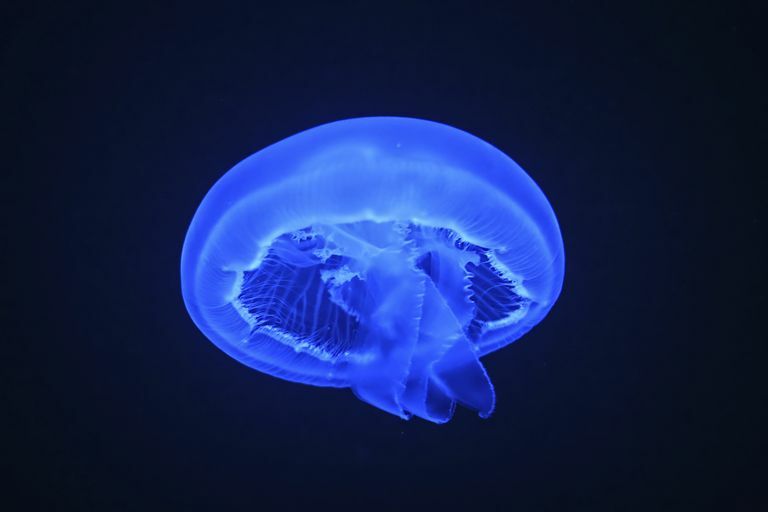 The jellyfish and its protein have all the trappings of a Hollywood special-effects studio: the jellyfish can produce flashes of blue light by a quick release of calcium (Ca​2+), which interacts with the photoprotein aequorin. Calcium is, in fact, part of the scientific support offered on the product's website, perhaps as a potential reason to believe. But there's a problem. Apoaequorin would presumably be digested in the stomach and GI tract so that it would no longer function as it does in the jellyfish, the skeptics hold. Does Apoaequorin Support Healthier Brain Function? According to the product’s website, apoaequorin supports healthier brain function. * There’s an asterisk after the claim, which refers down to a disclaimer: *These statements have not been evaluated by the Food and Drug Administration. This product is not intended to diagnose, treat, cure or prevent any disease. On the one hand, the supplement is a protein and protein is food, which when digested and absorbed, does tend to support cell health and function, including neurons. So the product’s claim is probably true. The product's website also does point to some favorable findings, including a double-blind placebo-controlled study (The Madison Memory Study) to support claims of improved cognition. Some critics have questioned the value of these studies, but that does not negate their presence. This is a supplement, so the proof required before marketing is not the same as that of a new drug. That said, there is a report from NBC news' Maggie Fox suggesting the Madison Memory Study failed to show a statistically significant improvement in the treatment group over the placebo group on any of the nine computerized cognitive tasks. Several facts listed on the website about how the product works seem supportive in isolation, but they aren't yet stitched together into a cohesive scientific explanation. For example, consider the statement “Apoaequorin is a protein our brains need for healthy function but is diminished in the aging process.” While this may be true, no claim is made that dietary supplements containing apoaequorin correct this problem. You get the idea. There's no definitive proof that it doesn't work, but the same can be said about a lot of things, such as taking a bath in clay or using a coffee enema. There may be something to this line of research, however: work supported in part by National Institutes of Health research grants suggested that a different preparation consisting of "calmodulin-cholesterol complex, not cholesterol-free jellyfish protein" may better serve as a dietary supplement to facilitate memory maintenance. Jahan-Mihan A, Luhovyy BL, El Khoury D, Anderson GH. Dietary proteins as determinants of metabolic and physiologic functions of the gastrointestinal tract. Nutrients. May 2011;3(5):574-603. Inspections, Compliance, Enforcement, and Criminal Investigations. Quincy Bioscience Manufacturing Inc 10/16/12. Moran DL, Tetteh AO, Goodman RE, Underwood MY. Safety assessment of the calcium-binding protein, apoaequorin, expressed by escherichia coli. Regulatory toxicology and pharmacology. 2014;69(2):243-249. Maggie Fox, NBC News. Jellyfish Memory Supplement Prevagen Is a Hoax, FTC Says. Morrill GA, Kostellow AB, Gupta RK, et al. Computational comparison of a calcium-dependent jellyfish protein (apoaequorin) and calmodulin-cholesterol in short-term memory maintenance. Neurosci Lett. 2017;642:113-118.